That’s right, people. It’s a double feature of Bikes to Like this week on Chasing Mailboxes. 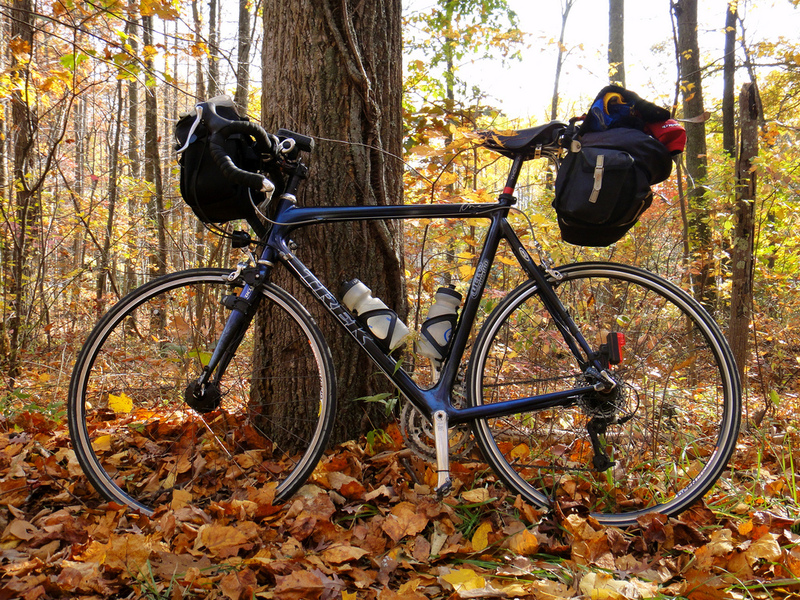 Today, I highlight Bill B.’s Trek Madone. 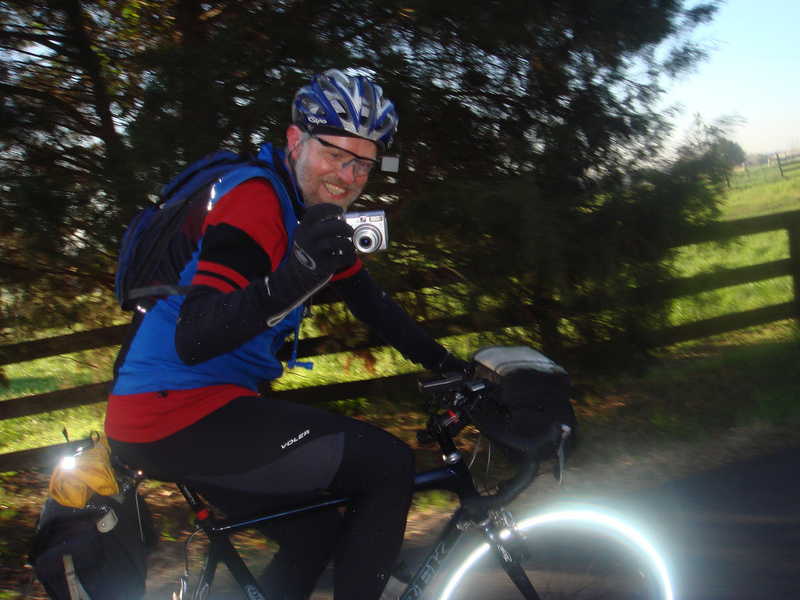 Bill, the excellent RBA for the D.C. Randonneurs and our head photographer, has completed many MANY brevets on his Trek Madone. I was curious how he managed to make a randonneuring bike out of what I would consider a more “racy” bicycle. Read on and find out how he did it! It started life as a 2003 Trek 5200 with the Project One “Andromeda” paint job. But after the bottom bracket shell came loose from the carbon frame in 2007, Trek replaced the frame with a 2006 Madone SSLx. 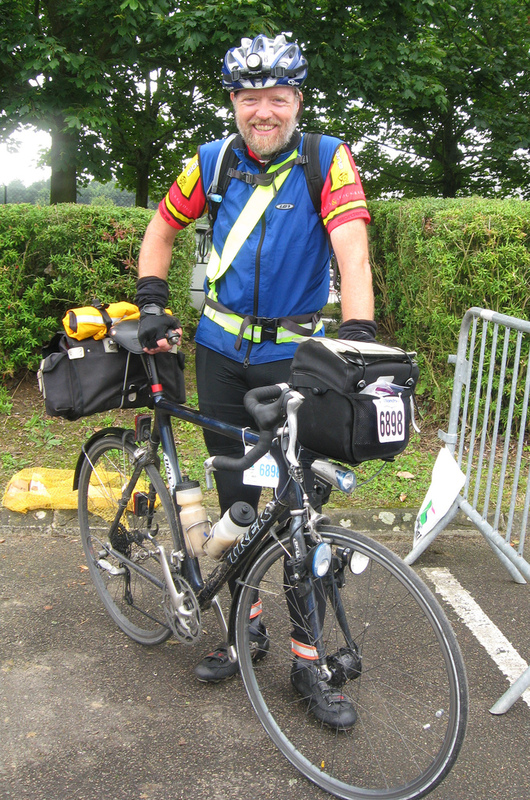 To adapt it for randonneuring, I switched to a Brooks B-17 saddle, mounted an Ortlieb handlebar bag and a Carradice Nelson Long-Flap saddlebag with a quick-release bagman support, switched the 30-tooth granny chainring to a 26, and changed the stock 12-27 cassette to an 11-34 with a mountain bike derailleur. I also usually use more rugged 32- or 36-spoke wheels and a SON generator hub. The guy at the store where I bought the bike and where they replaced the frame was very excited that the replacement was the super high end SSLx model. But he agreed that it was probably the only SSLx sporting a mountain bike derailleur. I have used it on every brevet since I started randonneuring in 2006, including Paris-Brest-Paris (PBP) in 2007 and the Endless Mountains 1240K in PA in 2009. 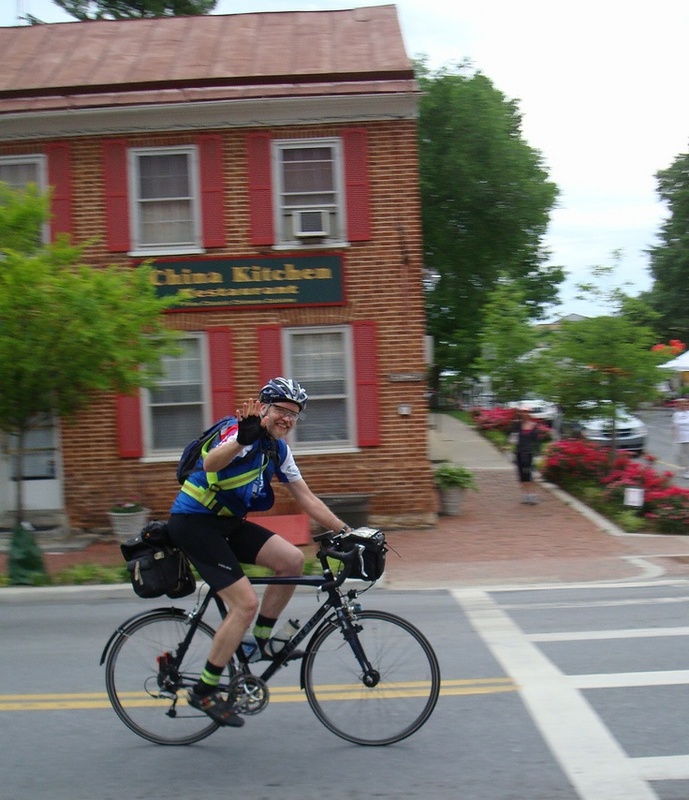 On weekends when we don’t have a brevet, I usually ride it to Gettysburg. It is still inspiring to me to ride through that battlefield. It climbs really well. (At least as well as it can with the engine I provide.) I still remember how much better it felt than my old bike the first time I rode it up a hill. The carbon frame is also good at soaking up road vibration from chip seal surfaces. And it doesn’t rust. I still think of it as a “sleek” racing machine, even though it doesn’t look that way with all of the rando luggage on it. The bike doesn’t have clearance for full fenders, so I use Race Blade clip-on fenders. They do a pretty good job of protecting me, but since there is no front section to the rear fender they don’t do much to protect the bike. 6. Does your bike have name? If so, what is it? I have a hard enough time thinking up names for pets. I don’t name machines. That would probably be my Ortlieb handlebar bag. I keep my camera and food in it, as well as my brevet card, phone, and money. The lid overlaps the body enough that everything stays dry even in pouring rain. But it’s very easy to slip my hand in to retrieve things. It has a nifty quick release so I can carry the whole thing right into stores or controls. I guess my favorite is this one right after I finished Paris Brest Paris. What a nice feeling at that moment! 9. What did I forget to ask that you want to tell me about your bike? If I finally buy a new randonneuring bike, I will take the luggage off the Trek and maybe even try some aerobars on it. I think it will be much happier set up as a fast bike again. Thanks for letting me feature your bike, Bill. Note: chasing mailboxes does not endorse aerobars, but we do endorse buying more bikes!